Signs have gone up at all the entrances to the East Lake Sammamish Trail in Issaquah alerting users to the imminent lengthy closure of the trail for paving. Here are photos of the sign and its map with a transcription below. Click for bigger versions (and click again on Flickr for bigger still). 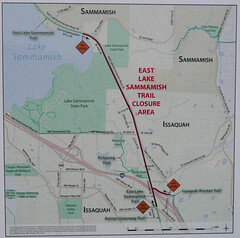 Construction of the East Lake Sammamish Master Plan Trail Project will require the closure of the southernmost 2.2 miles of the trail corridor in Issaquah for up to twelve months beginning in spring 2012. The section of the Issaquah-Preston Trail between the ELST and East Lake Sammamish Parkway will be closed as well. We appreciate your patience as we work toward building a better trail! 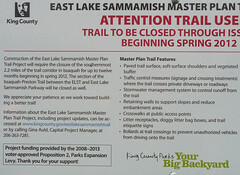 Information about the East Lake Sammamish Master Plan Trail Project, including project updates, can be accessed at www.kingcounty.gov/eastlakesammamishtrail or by calling Gina Auld, Capital Project Manager, at 206-263-7281. Project funding provided by the 2008-2013 voter-approved Proposition 2, Parks Expansion Levy. Thank you for your support! Don’t expect too much from the project site. They haven’t updated it since January when the project went out to bid. Start thinking about alternate routes if you’re currently a regular user of this trail. This is the best I-90 crossing we have even as gravel so its loss will be keenly felt during construction. Hopefully the weather and Murphy will cooperate and they’ll finish in record time!